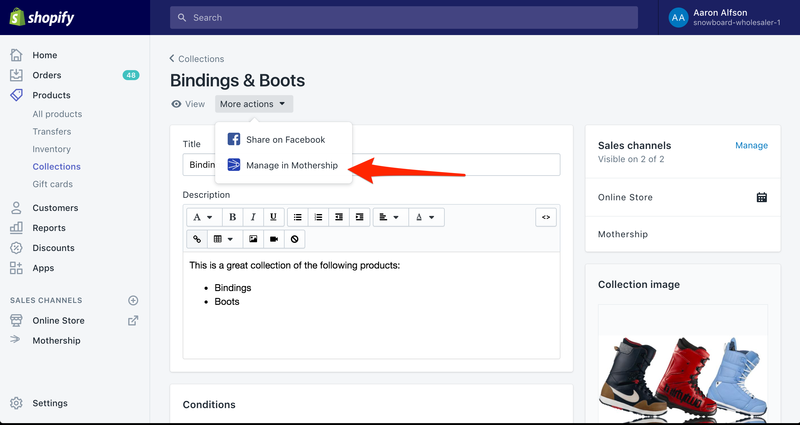 Only products that are currently published to the Mothership sales channel can be added to the product catalog. This process is idempotent. This means you can repeat this process below as many times as you like and a product that has already been added to the catalog will not be added again (no duplicates). But a product that was not added to a catalog on a previous run, will be added to the catalog on the subsequent run. 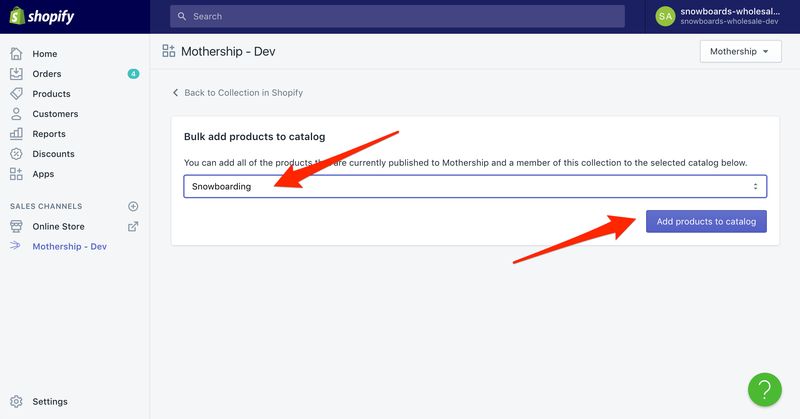 Create or select a collection in your Shopify admin panel that contains all of the products you want to include in your Mothership product catalog. Please consult Shopify for instructions how to create a product collection. Once you have a collection, make sure the collection is published to Mothership. Navigate to the collection's configuration page in the Shopify admin panel. Click on the 'More Actions' dropdown at the top, then click on 'Manage in Mothership'. On the next page, select the product catalog you want to add the products to. Next click the purple 'Add products to catalog' button. You should then see a message indicating that the products are being added in the background. You can repeat step 4 for each additional catalog you want to add the products in the collection to. And for future reference, if the products in the collection change, you can repeat step 4 to included the additional products.